— Former U.S. Supreme Court Justice Anthony Kennedy in Yick Wo and the Equal Protection Clause. The US Constitution is the oldest written national constitution still in use today. For over 200 years it has stood at the center of American political life and been celebrated by people from all walks of life and across the political spectrum. But it has also been the subject of vast disagreements, beginning almost the moment it was signed in Philadelphia in 1787 and continuing to this day. The Constitution Project seeks to make this central document, and the ideas and struggles that shaped it, accessible to people of all ages and backgrounds. The series explores the conflicts that have not only formed the Constitution but have influenced how we understand and interpret it. Episodes of the series cover topics ranging from racial equality to the separation of powers, from judicial review to immigrants’ rights and gender equality. They have traced the passage of a bill through Congress and the White House and explored the role that juries play in our legal system. But most of all they have told the stories of the individuals who have fought to guarantee everyone in America has the rights we enjoy each and every day. 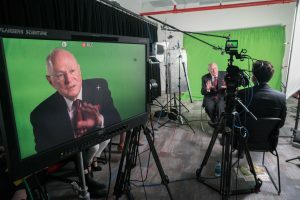 The Constitution Project has been honored with numerous awards, including CINE Masters Series, Special Jury and Golden Eagle Awards; the ABA Coalition for Justice Award; the Silver Hugo Award; the Telly Award; the Clarion Award; the Aegis Award; the Videographer Award; and the Platinum Hermes Creative Award. The series can be screened at the Annenberg Classroom. It is a project of the Annenberg Foundation Trust at Sunnylands.